7/2010: The City of Plainfield is apparently considering purchasing the Lampkin House. There are not yet any definite proposals or plans for the property. Despite its derelict condition, the Lampkin House is a prime example of early New Jersey residential architecture. It is a rare surviving example of the architecture of the earliest period of residential building in New Jersey. The Lampkin House is particularly significant in that it retains many rarely extant Colonial-era features. The Lampkin House is one and a half stories, of which the low-roofed upper story would typically have been used for storage and sleeping. The house exists in three sections built side-by-side, with the oldest, original cottage located very close to the road. The New Jersey Historic Preservation Office has assessed the additions to the original building as also likely to date from the Colonial period. Each is representative of what architectural historians have called a “deep East Jersey cottage,” the most common type of residence for persons of modest means in the eastern part of the state during the 18th and early 19th centuries. Lampkin house 2nd pictureDespite various exterior material changes, including the addition of dormers and Classical Revival detailing, the Lampkin House retains much of its original fabric, including a steep gabled roof, massive exposed fireplaces and exposed heavy framing. In addition, there is a surviving 19th century barn, which exhibits an original fieldstone foundation, wood framing and mortise and tenon joints, on the property. The Lampkin House’s occupants were directly involved in the Revolutionary War. The earliest traceable owner of the Lampkin House was Jesse Dolbeer, who owned the property from 1796 until his death in 1832. Between 1776 and 1781, Dolbeer fought in the Revolutionary War in battles including Woodbridge, Short Hills, Connecticut Farms and Quibbletown. The Lampkin House is clearly significant as a rare surviving example of very early vernacular residential architecture that retains an extraordinary degree of original character and is deserving of recognition and preservation as a remnant of Plainfield’s and New Jersey’s earliest settlement and the area’s involvement in the Revolutionary War. Yet its situation is extremely perilous – the house has been vacant since January 2008 and deteriorating since long before last year. The deceased owner was financially impoverished, leaving the estate with no money to complete needed repairs or regular maintenance. The City of Plainfield issued notices of “Unsafe Structure” and “Imminent Hazard” on the property in 2008, and the property continues to be threatened by the potential of purchase by developers who would demolish the house for the opportunity to develop the land. 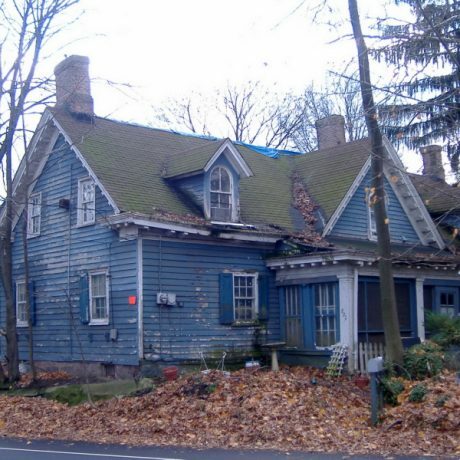 Preservation New Jersey believes that the Lampkin House has great potential for restoration: the property simply needs an appropriate buyer, and quickly, as deterioration continues. The Lampkin House shares a boundary with a municipally owned 30-acre preserved open space, and therefore, offers an ideal opportunity for successful historic preservation literally alongside open space conservation.